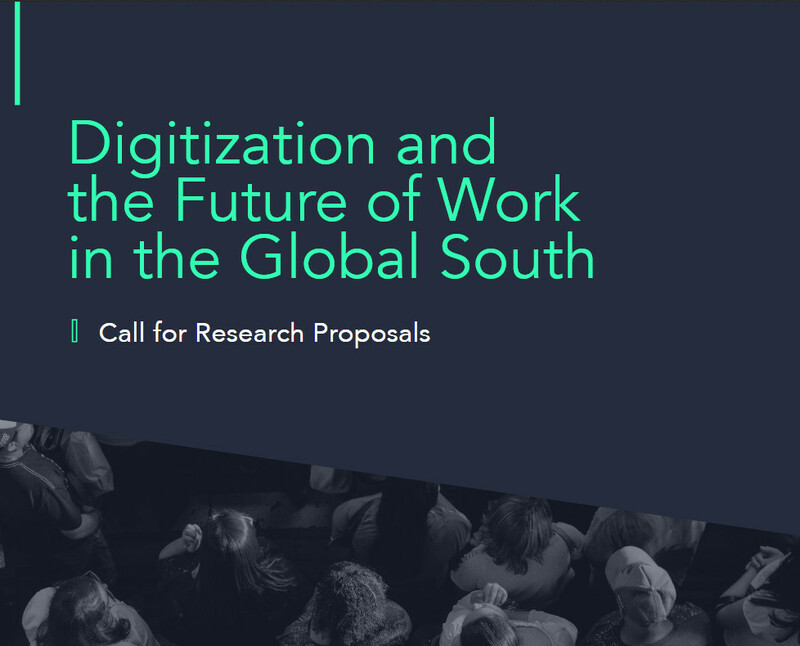 As part of the Future of Work in the Global South (FoWiGS) initiative, Centro Latam Digital and International Development Research Centre (IDRC) are launching a call for research proposals that seeks to advance our understanding about the implications of digitization and labor automation for countries in the Global South. Digitization and networked communications are increasingly touching all aspects of modern life. Among them is employment, a key organizing principle for society since the industrial revolution. A number of forces are currently reshaping traditional employment, and more generally how labor markets operate. First, advances in artificial intelligence (AI) in combination with modern robotics are threatening to automatize jobs that were previously considered too complex for non-human execution. Examples range from driverless vehicles to automated customer relations that are displacing specialized labor in transportation, sales, logistics and several other components along the value chain. Second, the emergence of digital work platforms is reshaping labor relations on a global scale, facilitating the unbundling of work into smaller tasks that employers can contract out to freelance workers around the world. Third, cloud computing and over-the-top (OTT) services are disrupting business models across a range of industries, favoring job relocation to a small number of technology-intensive regions. workers? Are there examples from low and middle-income countries specifically targeted at gig workers? the local, state and federal levels that promote new models of articulation with modern and, in particular, global value chains? perspective across two or more countries are encouraged. Proposals should address issues of gender equality, youth employment or social inclusion for minority populations. Researchers are encouraged to identify the practical implications of their research findings. This includes drawing policy recommendations and implications for development-oriented initiatives. Research projects are to be undertaken/led by a research-oriented institution with legal entity based in the Global South. Applications from individual persons will not be accepted. United Nations, donor, and multilateral organizations are not eligible to apply. Research projects up to CAD 100,000 (Canadian dollars) will be considered. The proposed budget should be strictly related to the project needs and should reflect the necessary resources for the collection of data or any other method of data acquisition and management. The selection committee reserves the right to propose adjustments to the budget depending on the availability of resources. Research projects will typically span over 12 months, including all research activities and final reporting. Exceptions for longer projects (up to 18 months) will be considered on a case-by-case basis and need to be clearly justified in terms of methodology and research questions. Applications should be submitted to fowigs@gmail.com in Word or pdf format. Incomplete applications will not be considered. Please indicate “FoWiGS Call for Projects” in the subject line. For information or questions about this call, please contact fowigs@gmail.com.